CISSP stands for Certified Information System Security Professional and is an IT security certification of the International Information Systems Security Certification Consortium. ISC is a non-profit organization specialized in explaining the IT security standards worldwide. This institution maintains CBK or common body of knowledge for cybersecurity and provides various IT security certifications recognized by globally. There are many reasons to do the CISSP certification. The CISSP designation is recognized worldwide and is a vendor-neutral standard that can be attested to the technical skill and experience of an IT professional to implement and manage the security program. The CISSP certified IT professionals job titles are Security auditor, security architect, security systems engineer, and chief information security officers. To become a professionally certified CISSP, the candidate must pass its exam with a 700 score minimum out of 1000. It is a six-hour long examination consisting of 250 questions. There are multiple choices and advanced innovative question to test the knowledge and understanding of candidate in eight domains. Those eight domains of CBK are security and risk management, security engineering, asset security, communication and network security, security assessment and testing, identity and access management, security operations and security of software development. The certification is widely recognized by a large number of companies in the targeted industry. Nothing matters in how difficulty is there in achieving this certification if no one is aware of it. This certification is very difficult to achieve that separates high potential performer from the rest. This top-level certification significantly increases the chance of getting higher pay jobs that recognizes your talent and uses it in the right way. The need for skilled security experts has become critical with the shortage in the talent. This certification is very important because it provides all those necessary grasps of cyber security. In the subject, they cover how to build a clock, secure access and understand the legal security ramifications. A CISSP certified professional is capable of handling a different range of cyber-attacks and threats. They can manage a range of cyber security skills such as asset security, software security, network security, disaster recovery, and incident management. Working with such a professional can fulfill certain certifications that are mandatory for various clients and subcontractors. 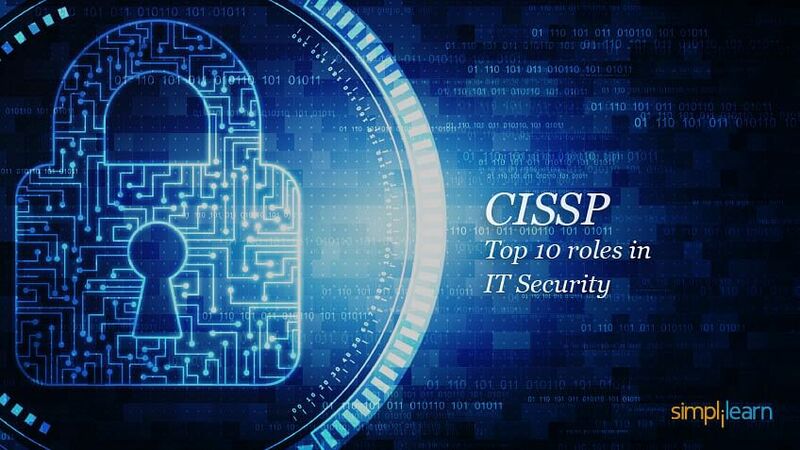 CISSP is often asked due to their role requirements because you will have a basic understanding of the whole concept of IT security you display in your professionalism. The Top 10 IT Security Roles! Computer security specialist knows them. Their role is somewhat similar to security analyst but limited in scope. The responsibilities of this role are unique; it includes analyzing and defining various security requirements of an organization system. They must identify which threat must be reported, design security audits and provide technical support to the colleagues. They are software engineers who are asked to do everything from system maintaining to deploying training programs to employees and developing application programs for security. They must possess a Bachelor’s degree in computer science or any similar field with CISSP certification. Other soft skills such as communication and collaborating skill are also needed. Senior-level executives get paid well, and CISSP is no exception. Chief security offices are valuable for the companies where they work. The reason is they offer the best in two ways simultaneously: technical skills and business profit. CISO must need management skill; they have to oversee security engineers and manage incident response team of the company. But that does not mean it is completely a management job. The chief security officer is responsible for the data privacy of the entire company, regulatory compliances, security practices and threat prevention of the company. Also, they must give support to the incident response team alongside. Often they have to work with Chief information officers also because it comes in their part of the job to protect the revenue of that company. In large companies, a chief security office must report the information officer because of data analyzing or sensitivity to it. If a chief security officer works in any insurance or financial services should report to the CEO directly. Typically security analysts deal with information and threat protection. It includes event management, security information, UEBA or User and Entity Behaviour analytics, IPS or Intrusion prevention system and also penetration testing. The main security duties involve are managing the security control and measures, internal and external audits, monitor access, analyses of security breaches any, security awareness training, the recommendation of process and tools and coordination the company security with other vendors outside. Globally, an information security director has to maintain and execute IT security projects and coordinate the response of any breach or attack if occurs. The director must have working knowledge in a specific industry with their rules and regulations like FISMA of Finance Industry or HIPAA of Healthcare Industry. Moreover, they must have a BS degree in computer science and security certification. A senior security consultant can minimize the security risk of any organization. They analyze current settings of security and provide a recommendation for better procedures, practices, tools, and software. They will analyze and do a modification of firewalls and other packages of software and hardware too. A senior Security consultant has to wear many hats in their profession. They may handle security training sessions, participate in a meeting to craft new cyber security policy, implements standards of IT security across the device and create a risk analysis report and recommends to the management. Information security manager has to lead security training, policy and audit efforts of an organization. The manager duty is to review the implementation and configurations of security software to ensure that the data is safe. If any breach happens, they have to lead the forensic investigators and mitigate efforts. The security managers must be good people with proper management skills. They are asked to work with different departments of the same organization, especially IT. Some of the security software engineers keep themselves away from management jobs and stick with security engineering roles only. A security engineer has to work towards preventing breaches or minimizing its impact. They should secure and monitor networks and systems, install firewalls, encrypt programs, hunt down vulnerabilities within the organization system and network and must respond towards security incident. This role also has an education feature as well. The security engineer must help people in the organization by improving awareness through training programs and some other strategies. A security team leader performs the same as a security engineer, they provide leadership within their team, but they do not perform the role of traditional management. Typically, they entail overseeing and delegates to small development teams, mentors new developers, oversee the work done on all project and communicates closely with the management. But they perform within the position of the technical staff of the company. A data security analyst has to protect sensitive data from companies like billing information, credit card details, customer data and much more. Typically more focus is given on the secured cloud servers where the data is stored. Their role involves determining the data and should get stored in a susceptible location and create protocols for securing that information. The data security analyst must report important vulnerabilities and necessary correction to the IT security teams for follow-ups, analyze the accessed date to know who has accessed it, where, when and how often. The penetration tester must look all vulnerabilities of the system and network of the company to find the weak area before hackers do their job. Their part of the job is to ameliorate passive threats like poor passwords. They also have to work with cyber security or IT teams to not only find the area of security weakness but also transmit information to other teams, to take the right mitigation steps. These are the top 10 roles of information security high in demand. Whether you want to work as of raise or bigger challenge, the following roles of cyber security will help in knowing the importance of CISSP for IT security. All these roles ask for cyber security certification along with qualification. Therefore CISSP certification is arguably very important for IT security profession.